Today on Write On we are lucky to feature Nadette Rae Rodgers, author of Illusion and the forthcoming Illusion Trilogy. Nadette is a Pennsylvania author, passionate about writing for all ages. Her interest in dreams inspired her first novel. For Write On, she helps us explore dreams and dreamscapes in writing. Nadette is a member of the Quill & Scroll Society. She was also a featured author at the Beaver County Book Fest and Passages & Prose 2016: A Gathering of Authors & their Books. Follow her on twitter @NadetteRae and read more of her writing on her blog. 1) Your Illusion Trilogy plays with the idea of dreams invading our real life. Did you base this premise on experiences from your own life? 2) From a psychological and neurological perspective, there is a great deal of disagreement about the role of dreams and the role they play in our lives and our health. How do you integrate these contradictions in your writing? Everyone dreams. Some people may not remember them in the morning, but everyone does. Some dreams are inspirational or calm, while other dreams, or “nightmares”, cause anxiety for many people and can shake you to your core. I wanted to really play off of a natural occurrence all people could relate to and that’s why I chose the topic of dreams. In the book, Addison’s dreams definitely affect her health. If she fell in a dream, she’d wake up with a cut and blood dripping down her leg. REM Behavior Disorder is definitely a real thing- very rare, but real all the same- where people act out the dreams they are having. Typically, it is not to the extent of Addison’s dreams as I was trying to exaggerate this, but for people suffering from any type of sleep disorder, dreams play a big role in their health. 3) Writing classes often malign the use of dreams as a cop-out for the ending of stories. How do you recommend writers incorporate dreams and dreamscapes into their writing while still avoiding the cliche-riddled path of “it was all a dream” endings. Well, in the case of Illusion, it may appear that I followed that cliche-riddled path of the “it was all a dream” ending. However, the reader will uncover more to Addison’s story in books two and three, which I can’t say much about just yet. 4) Do your own dreams inspire your writing? Not really. I can’t say I’ve ever experienced dreams like Addison. I would say that my interest in dreams inspired the book, though. 5) Have you read much on the analysis of dreams–do you see any value to this approach for writers who want to explore the unconscious mindscape in their writing? I’m very intrigued with dream analysis, so I’m always analyzing my dreams the next day! Dreams are a very common occurrence in books; I could list books I’ve read in the past few months that all have a dream scene or a description of a dream. As with any part of the plot, the dream sequence should tell part of the story. You don’t want to have a pointless dream that tells the reader nothing and acts as filler. So I would say any research, even just investigating your own dreams and figuring out their meaning, can offer relatable insight into the mind of your character when you write a dream scene. 6) What was your favorite part about working on the Illusion Trilogy? I think my favorite part was the ability to take something that everyone could relate to (dreaming) and turn it into this whole other world. The dream realm and the dream scenes were probably my favorites to write because it was so creative and intriguing to me. The possibility authors have to turn words into a whole world is still amazing to me! 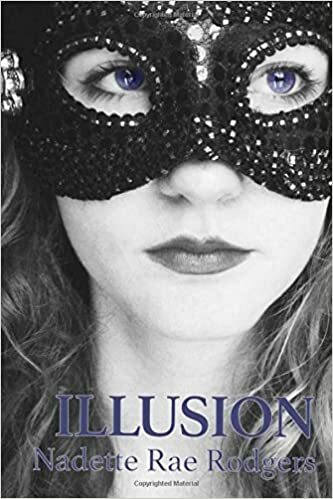 I am currently working on the second book in the Illusion Trilogy, so I’m hoping to have that out sometime soon! Writing the sequel has allowed me to dig deeper into the characters’ backstories and write from new perspectives, and doing so has given me ideas for future books- some not related to the Illusion Trilogy.